Halloween is a wonderful time for kids to dress up and fill up on high sugar treats. However, as much as you might love to get creative with fancy face painting designs and scary Halloween make up, the final product getting smudged might be the least of your worries when you learn about the dangers of lead contamination by using Halloween makeup. There are so many kid’s dangers around these days and many parents are not aware of the dangers of lead. Lead is a neurotoxin that can get into the body and affect every organ. It is a known carcinogen. There is no safe level of lead for children however many products, even those designed specifically for kids, contain levels of lead that may pose a risk. Products applied to our skin are so easily absorbed and for children they are much more vulnerable and therefore their risks of lead exposure and contamination by use of makeups containing lead can be much higher. The cosmetics industry in the US is not regulated and a study by Campaign for Safe Cosmetics found that up to 66% of lipstick products contained a number of toxic metals including lead. Such ingredients do not have to be disclosed on packaging. Of course when it comes to Halloween this is the time makeup hits kid’s faces. The Campaign for Safe Cosmetics also tested 10 kids Halloween makeup and found that all 10 contained low levels of lead. They noted that the effects of lead exposure in a young child can lead to issues including hyperactivity, aggression, behavioural issues, IQ deficits as well as affecting school performance. While lead is banned from makeup products in Canada and Europe it is not banned in US and with so many US products around how can parents be sure that they are not unnecessarily exposing their kids? 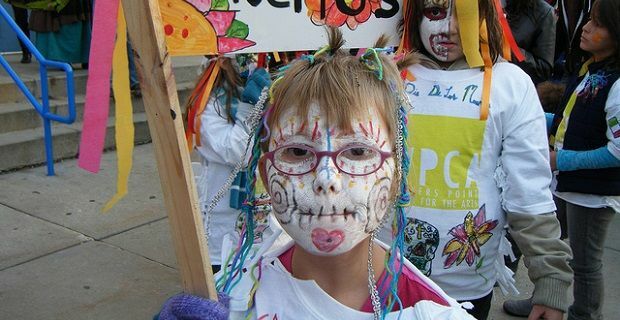 Of course not putting any face paint on your child is the only sure fire way to avoid any potential risk but if you do want to put face paint on your child make sure you use a product made by a trust worthy producer.